Alex Cumber recently purchased a Cougar S8 power assisted handcycle direct from Team Hybrid, here are his thoughts on Cougar ownership…. A marriage made in heaven. This is a romantic story about cold metal and warm leather; a story of pieces of mobility equipment falling in love with each other and their owner. A story of empowerment; carrying on when your first reaction is to give up and stay home. Because at first glance I look like an extra in a 70’s biker movie, people are sometimes surprised to learn that I’m a medically retired vicar in my 40’s. I’m a life coach, creative therapist and spiritual director. I also serve as chaplain at a large shopping centre. I’m a keen artist and photographer. 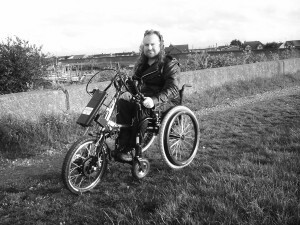 As a paraplegic the thrill of a two wheeled motorbike is beyond my grasp and the delight of a trike is denied me, due to concerns DVLA may have for both my safety and that of other road users. So where do I turn for thrills? How do I get off the beaten track and experience a jealous wind whipping me in the face? I live near the coast and surrounded by fields. I want to enjoy the great outdoors, to explore with my wife; to enjoy bounding across fields and rushing along the prom with our dog. When I turned 40 my dad gave me a top end Crossfire all-terrain wheelchair for my birthday. With its rugged design and chunky wheels surely I could go anywhere? But I didn’t have the strength needed to push a great distance and I’m not the lightest person to push over hilly and difficult ground so I started to explore my options, to contact every firm I could find in the UK making off road mobility products to product test them, to reflect on and debate their performance via Twitter. In the process I enjoyed a bit of mad inventing, gathering old parts off eBay and trying various ways of assembling everything from hand cycles to remote control skateboards in an endless journey for the ultimate paraplegic adrenalin rush. The answer was to be found in relationship and romance. My top end wheelchair needed a boyfriend. She is a lovely companion but she required a Prince Charming to scoop her up and carry her across unconquered territory. Don’t get me wrong, we still enjoy girls nights at home, I keep her well groomed and she’s a fab gym buddy, but she becomes so much more that that when teamed with her new soul mate. Enter the Team Hybrid S8 hand-powered hand-cycle attachment. As a vicar I’ve had the joy to marry many people – that wonderful concept of two becoming one flesh; strengths and weakness working in partnership in order that dreams can be fulfilled. Once Team Hybrid had attached a simple docking station to my Crossfire wheelchair, the Cougar was able to easily glide into place and become securely and safely attached. So how did this romance begin? A wonderful demonstration visit to my home on Canvey Island from Team Hybrid enabled me to enjoy an accompanied day exploring the Island using that wonderful combination of wheelchair and power trike attachment. After some months of deliberation, during which Hybrid answered my seemingly endless questions I was ready to place an order. The process was very simple, a deposit was needed (and one of my eBay hand cycle experiments and an old wheelchair were accepted in part exchange). A few weeks later my wife and I enjoyed a few days away in our motorhome, camping in the grounds of a pub near to Team Hybrid’s headquarters. Hybrid were very accommodating when we experienced a flat battery outside their workshop caused by running too many useful disabled modifications on our vehicle! When attached the Cougar and Crossfire become the most amazing partnership. They eat level ground and make a very valiant job of crossing even the most rugged of terrain at quite an incline, even in damp weather. They keep me guessing with the occasional wheel spins, but experience and the wisdom of other users enables one to overcome the most challenging of environments. I sense the sadness of the Cougar when he undocks from the Crossfire, but he is put safe in his storage bag or plugged in to recharge and she is pleased for a bit of ‘me’ time. The wonderful thing is that the Cougar can be left safe and insured outside the gym, pub or shop whilst the Crossfire and I go about our daily routine. The two can fit neatly into a vehicle and as such are the most useful of traveling companions. Although I present like a Hell’s Angel I enjoy bliss (a Latin word for the joy of Heaven) each time I go exploring with my Crossfire/Cougar combination. It is a liberating marriage that enables me to fly on the wings of angels, whilst remaining safely grounded; on reliable kit, exploring the delights of Canvey Island and beyond. I love my Cougar. I love the attitude and company of Team Hybrid and thoroughly recommend their products to you.